Step-Up transformers are generally used to boost up low voltage, an thus stabilize the Voltage from transmission line, which is harmful to our costly equipments/ house appliances. 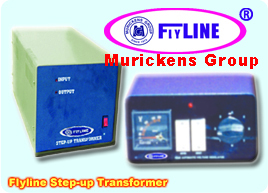 Muricken's FlyLINE Step-Up transformer is a special as it always maintains standard 240Volt which is required for Indian home appliances. Step-up transformer is widely used in many power applications as it helps in increasing incoming power Voltage. There are two types:- Standard model and Wide range, Standard model works from 160V and wide range from 120V. Two types:- Standard model and Wide range, Standard model works from 160 voltage and wide range from 120V ► Protects your electronic/electrical equipments. ► Helps your A/C and other equipments to work even when power supply is low in Voltage. ► Compact in size. ► Protection from Lightning. ► Rotary Switches. ► Maintenance Free. ► Auto Resetting facility at Normal Voltage. ► Single switch operation. ► Noise free. ► Unnecessary indicators and switches are avoided to make the transformer more user friendly. ► Available in the range of 1 to 5 K VA.